Sometimes I am still in college running the radio station, but as those who read this blog know I love Tom Petty, maybe because he's a good ol' boy from Florida. Anyway here is what I am eagerly awaiting. Especially the live 'leg bootleg...on vinyl?! Along with powerful interpretations of their own classic hits and originals, The Live Anthology features the band tackling some of their best-loved cover material, from classics to obscure beauties to unexpected adaptations. The theme from TomPetty.com Announcing 'The Live Anthology'Goldfinger, the Zombies’ “I Want You Back Again,” the Grateful Dead’s “Friend of the Devil,” early Fleetwood Mac’s “Oh Well,” Booker T. and the MGs “Green Onions”, James Brown’s “Good, Good Lovin’” and many more. The Live Anthology is the band’s story told through the music alone; the producers made no fixes or overdubs. In addition to offering The Live Anthology via digital outlets including iTunes, The Live Anthology will be available in the following four configurations, each with artwork and packaging by renowned contemporary artist Shepard Fairey (Studio Number One, Obey Giant). - Two previously unreleased DVDs including the 1978 New Year’s Eve concert from Santa Monica, CA and the Martyn Atkins documentary 400 Days shot during the recording and tour for Wildflowers. - AND MUCH MORE (see details below). 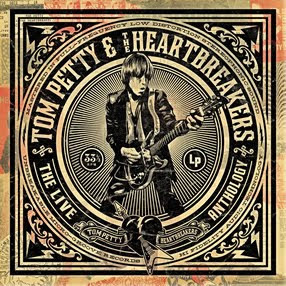 The Tom Petty and The Heartbreakers Superhighway Tour is a first of its kind digital tour experience that delivers to ticketholders 24 of the 48 Live Anthology tracks over an 8 week advance period. During this period ticketholders will receive an insider’s view of those 24 tracks, whether through archived memorabilia, new band commentary, classic reviews from the vaults, and more amassed rare vintage Tom Petty and The Heartbreakers content. More information including The Live Anthology release date will also follow soon from TomPetty.com. In the meantime, we hope you enjoy our new website. Many more features will be added in the coming weeks!